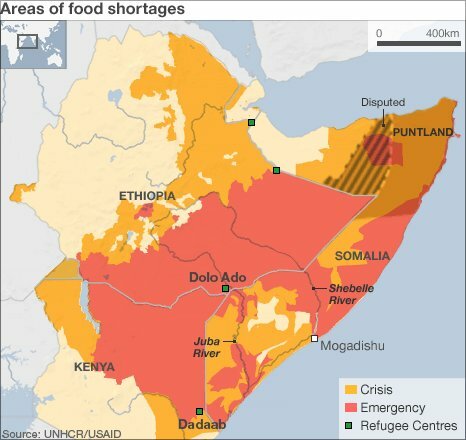 United Nations declare southern Somalia a “famine-hit region”! The United Nations (U.N) has declared Somalia a “famine-hit region”, due to a severe drought affecting more than 10 million people in the Horn of Africa. Some of these areas in southern Somalia are controlled by Al-Qaeda inspired Shebab insurgents. In Somalia, a total of 3.7 million people are suffering from drought. Consecutive droughts have affected the country in the last few years, while the ongoing conflict has made it extremely difficult for agencies to operate and access communities in the south of the country. Officials warned that unless urgent action was taken the areas afflicted by famine would grow. The UN said the humanitarian situation in southern Bakool and Lower Shabelle had deteriorated rapidly. Meanwhile, the UN and US have said aid agencies need further safety guarantees from armed groups in Somalia to allow staff to reach those in need. Al-Shabab, an al-Qaeda-affiliated group which controls large swathes of south and central Somalia, had imposed a ban on foreign aid agencies in its territories in 2009, but has recently allowed limited access. An estimated 10 million people have been affected in east Africa by the worst drought in more than half a century. Tens of thousands of desperate Somalis have been trying to flee their country to neighbouring Kenya or Ethiopia. More than 20 million people are in urgent need of food aid in eastern Africa, with charities warning of a full-blown humanitarian disaster. It is the first time that the country has seen famine in 19 years. Countries affected across the region include parts of Kenya, Uganda, Ethiopia and Djibouti, while the United States on Tuesday also urged secretive Eritrea to reveal how severely it has been hit by the drought. Few months back, La-Nina had been blamed for this drought. ← Cyclone Yemyin – The untold story!